For your ideas? For the secret notions you have for who you really want to be? Or think you are? Who are the friends, family or co-workers who are most accepting of your true self? And how do they demonstrate their acceptance? What is different about how they treat you than other people? I have a small circle of friends that I go to to bounce my ideas off of. As well as a select few of my family members. They show their acceptance by adding their input and talking me through whatever I mention to them.They are realistic with me. If I come to them with something that I haven't thought through they let me know and if it's something good, they push me. This is so great! 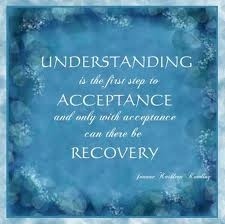 I actually just got back from a jog and during it I was thinking about acceptance and what it really means! What timing. :) Very good questions you ask. And it sounds as though you have some very good and supportive people around you. That is a powerful thing to have. Great work! Thank you. The questions actually came from wordpress from their post a day/ post a week challenge. But it did get me to thinking about my own group and I love that. I love being aware of myself and what get's me to that next level and I realize that group, my group, of people are a big part of what keeps me going, what keeps me experimenting, and what keeps me trying. The first question is pivotal. We find acceptance, foremost, in ourselves. We need to have a notion of self-acceptance. Think entails having a significant degree of who we are. Then, family, friends, etc. are more apt to accept us. Acceptance from others is them not being nonjudgmental. However, there are those that think that they need to validate us. I think to validate is to pass judgment. Stop by to read and leave commentary on my last two posts. I would love to hear from you. Check me out on twitter too.